This sample data file shows how the data are formatted and is for example purposes only. Global summary of the day is comprised of a dozen daily averages computed from global hourly station data. Daily weather elements include mean values of: temperature, dew point temperature, sea level pressure, station pressure, visibility, and wind speed plus maximum and minimum temperature, maximum sustained wind speed and maximum gust, precipitation amount, snow depth, and weather indicators. With the exception of U.S. stations, 24-hour periods are based upon UTC times. Values are usually delayed 24-48 hours from the time of observation. Purpose Global summary of the day is comprised of a dozen daily averages computed from global hourly station data. Daily weather elements include mean values of: temperature, dew point temperature, sea level pressure, station pressure, visibility, and wind speed plus maximum and minimum temperature, maximum sustained wind speed and maximum gust, precipitation amount, snow depth, and weather indicators. With the exception of U.S. stations, 24-hour periods are based upon UTC times. Values are usually delayed 24-48 hours from the time of observation. Lineage Statement The Global Summary of the Day is a subset from the Integrated Surface Hourly dataset (DSI-3505) that allow for "on-the-fly" calculations for users. 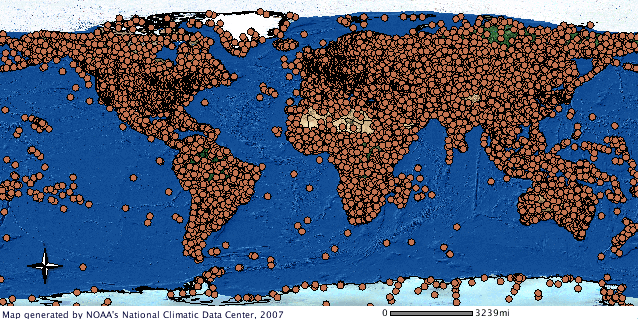 Landing page for the Integrated Surface Global Hourly Dataset, including links and other information.